An extremely attractive c. 1860 of South Africa and the Cape of Good Hope. Covers much of the southern top of Africa from S. Helena Bay and the Cape of Good Hope to 'Kaffir Land' in the east. This highly detailed map is most likely based on Edward Weller's map of the same region prepared for the Weekly Dispatch Atlas. Highly detailed and full of interesting notations such as 'Parts most infested with Wild Bushmen.' Color coded according to region. Published as plate no. LXIV in Blackie's Imperial Atlas. 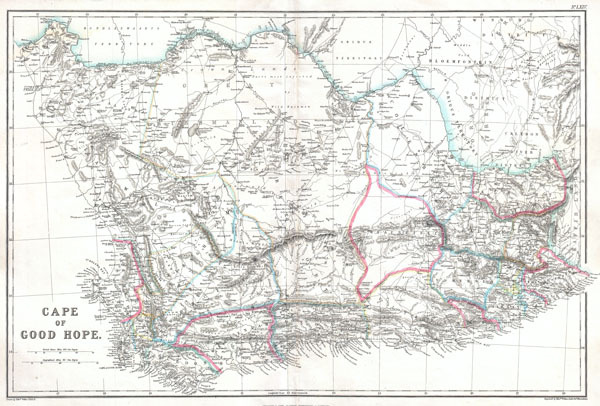 Blackie, W.G., The Imperial Atlas of Modern Geography; an extensive Series of Maps, etc., 1860.